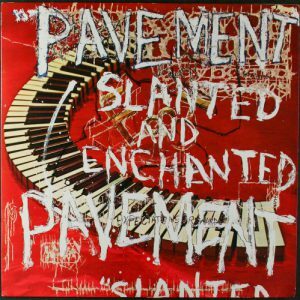 One of the more fun things about Slanted and Enchanted were the song titles, some of which had something to do with the lyrics of the songs, and some which didn’t. So there was a sometimes a bit of a disconnect as to which song you were listening to. While “Loretta’s Scars” and “Two States” were obvious, it took a while for “Summer Babe” to get to the titular babe. Then again, there were songs where the title seemingly had no bearing whatsoever to the words. For example: “Jackals, False Grails: The Lonesome Era” or “Our Singer,” or most especially, “Perfume-V” the title of which has almost nothing to do with perhaps the most otherwise easily grokked song on the whole record. 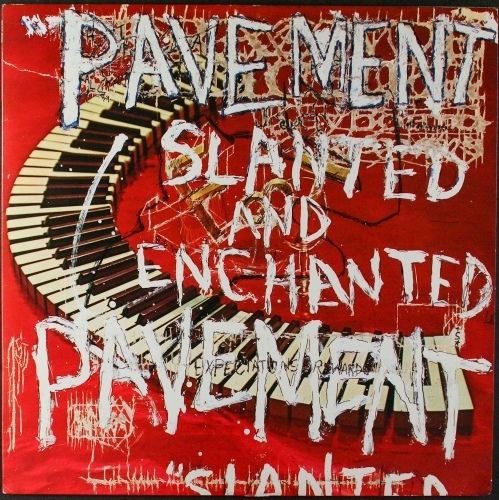 Unlike a lot of other Pavement songs, there isn’t any trickery on “Perfume-V:” no stop-time parts, long guitar solos, breakdowns, tempo shifts, or anything like that. There is a bit of the loud-quiet-loud with the riff, verses and chorus, and near the end, there is an overdub of a counterpoint vocal to the chorus, but to anybody who grew up on the Pixies or R.E.M., that’s pretty normal stuff. So “Perfume-V” kicks off with Stephen Malkmus and Scott Kanneberg playing jagged, glistening guitars, which drop down while Malkmus sings the verse, and then burst into near-shoegazey noise as they rip into the chorus. Now back in the awful Summer of 1992 when I was blasting the CD of Slanted and Enchanted from my boombox in the Video Zone office or maybe out of the front room of my Tower District apartment while I was enjoying a cocktail, I know that chorus was one of the first things on the whole record that got through to me — according to my records, “Perfume-V” was the first Pavement song that made any of my mixtapes (the most on-brand sentence I will ever write) — but I could never remember which song it belonged to. To be fair, Malkmus does use the word “perfume” at the end of the second verse, something I just found out when I looked at the lyrics online. And as a matter of fact, even when I was doing the preliminary work for the Pavement Certain Songs posts, I would look at the song title “Perfume-V” and not know for sure which one it was. It might be that I’m writing this post just so I’ll never forget: on my deathbed, I’ll have the playlist that was permanently embedded in my brain dial up Pavement, and I’ll know exactly which one it is!